POP Peeper 4.1.1.0 is out! 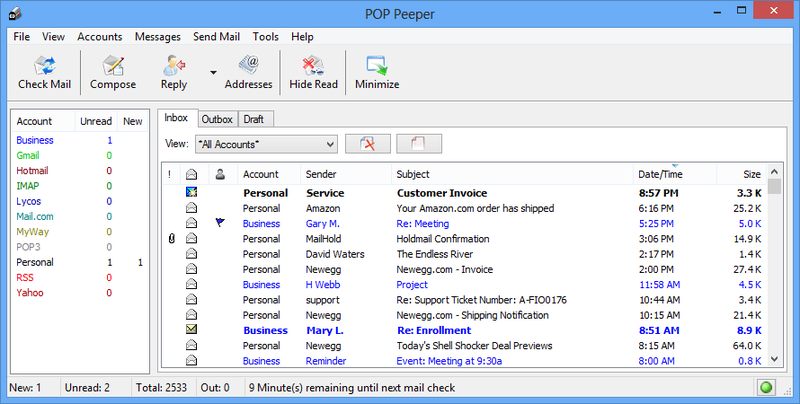 "POP Peeper IS an email notifier" but is categorised under "Internet - Email Clients (4)" ("email clients as a supplementary function") with EssentialPIM, SeaMonkey and Opera Presto. Surely, POP Peeper would be better categorised under "Internet - Email Clients (11)" ("email clients as a primary function") with nPOPuk, PopMan, etc. As a blind person using speech I needed a new email client. I gave this a try and I am quite impressed. I found it easy to set up and it works well with my screen reading software. One of the best e-mail programs I've used. It works well with my ISP's SSL-based POP3 e-mail. It's programs like this that make visiting Portable Freeware so enjoyable. good job. thanks a lot and, please, follow this way. With POP Peeper I can check Yahoo mail by POP3 account (with others similar programs I can't), also Gmail, and Hotmail, and as might be expected SSL POP3 accounts.Great program! Pure awesomeness. Very easy to use. Excellent program. I've used it for a couple of years now and have had no issues with it. I use it to monitor several yahoo and gmail accounts. pretty good app, but a bit resource hungry compared to some others. updates aren't frequent and one MAJOR downfall is no filtering - at all. i see Gmacri (poster above) is waiting on spam filtering. don't hold your breath :) i've been waiting for at least a year and it's one of the most requested features. Excellent software. One of the best. Now, no spam detection (blacklist, friend list, rules, etc.). I'm waiting for the update. I've got v3.2 and been running it for a while, a couple of minor drawbacks though, you can save the attachments to disc but there's no 'button' to save the message. A way round this is to view the source in a text editor and save it with the extension '.eml', you can then view the entire message with, dare i say it, Outlook Express, (phoo yuk). I downloaded it and am running it, (V3.1), on my pendrive. It's very intuitive, (easy to use), and i'm impressed enough to make a donation. I may be old fashioned but with free software written this well I feel it's important to encourage and help fund. works wonderfully with Excite, gmail and yahoo! I think it's not possible to stablish rules or filters, for instance, for being notified about a certain types of emails. Am I wrong? PopPeeper is superb. Provides strong security against email-based malware of all types. Very stable. Stringently maintained and supported. Whether you have dozens of email accounts (as I do) or only one, PP is by far the best mail client & management tool I have ever found, & I have tried plenty of them. Thank you very much for this marvellous program. Lightweight, decent-looking, intuitive and logical to use. Ability to import mail account settings from Thunderbird was a very nice surprise. If some day Thunderbird address book could also be automatically imported... I have used nPOP to check mail (with my desktop comp - Thunderbird is quite heavy-weighted and opens new windows), POP Peeper is my new choice. Since its inception this has been a wonderfully written application, incredibly useful application. Now with the addition of portability, it is perfect. Also note that the author is top notch and cares that his freeware product is of good quality. Thats is lacking in alot of freeware authors these days.